Almost three years ago, I took a completely unplanned, almost-three week break from posting on the blog. I wanted and needed to get a post up, but didn’t have any projects ready for photographing or worth sharing. On a whim, I decided to share the various ways we using the small upper cabinets in our kitchen. It’s a post that was almost never written and certainly wasn’t planned; but to date, it is now my most pinned, featured, liked, shared and visited blog post ever. Over the last few months, I’ve been giving a lot of thought to why that particular post has done so well. I think it’s because it offers a quick, easy, affordable and logical solution to an everyday problem that a lot of us have in our own kitchens. I didn’t show any huge makeover or make any significant changes to our kitchen, but the solution I shared was the “smack yourself in the forehead” kind of answer anyone can do! 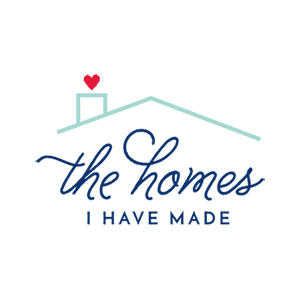 How can I help my readers make easy yet meaningful changes in their homes? How can I share all the tips and tricks I would suggest if I was standing in their kitchens with them? How can I motivate, encourage and inspire my readers to de-clutter and improve function in their most-used living spaces? How can I reach those that really want and need my help without boring those who don’t? I am beyond thrilled to share with you my answer to all these questions and more! Friends, let me introduce you to my Conquer Your Kitchen Crash Course! I have spent the last few weeks pouring hours and hours (and more hours) into brainstorming, planning, designing, and researching this new email course! 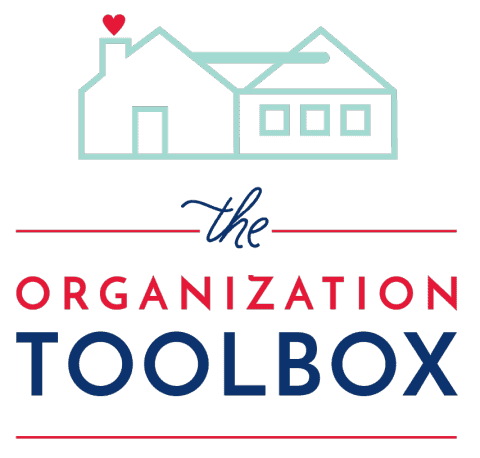 I am really proud of everything I’ve put together for this course, and believe I have a truly valuable and effective resource for dealing with clutter and improving function in one of the most used spaces in our homes! It’s been a really long time since I’ve been so excited about something, and today I’m going to tell you all about it! 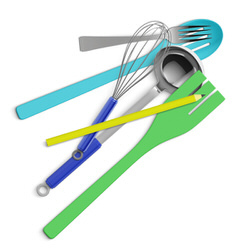 If you need a big ol’ kick in the pants to deal with your kitchen clutter, this is it! So what is the Conquer Your Kitchen Crash Course? It is a 5 week email course jam-packed full of all my best tips, tricks, and ideas for de-cluttering and improving function in each and every area of your kitchen. I’ve taken everything I’ve done in our own homes, ideas I’ve helped others do in their homes, and the brilliant solutions I’ve seen/read about all over the web and rolled them into one, step-by-step course to help you truly conquer the clutter in your kitchen once and for all! I pride myself in coming up with easy, logical solutions to organizing problems, and this course is no different. 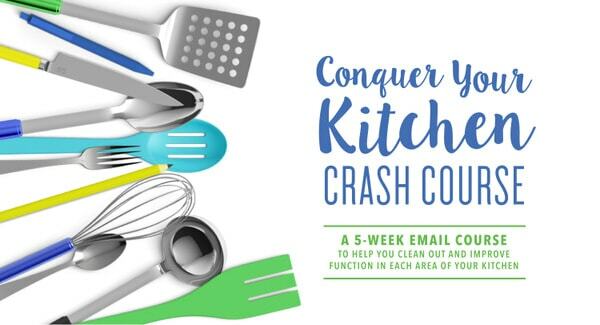 The Conquer Your Kitchen Crash Course takes a systematic approach to working through your kitchen. 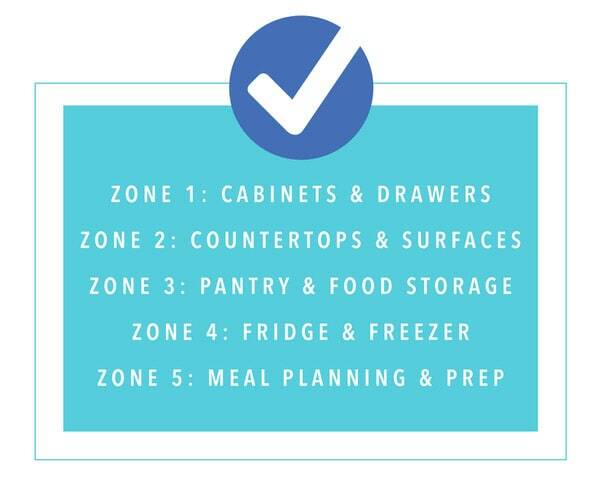 While you certainly can knock out everything I’ve put together in a weekend (or even a day, depending on the size and state of your kitchen), I’ve broken the kitchen into 5 distinct zones and encourage you to work through each zone in just a few hours each week. Each week of the 5-week course, participants will receive an email and coordinating digital materials completely focused on one of the 5 zones (outlined below). At the end of the 5 weeks, no area will be left un-touched, and you’ll be able to increase productivity and reduce stress in your kitchen space! In addition to breaking down the kitchen into manageable zones, I’ve also come up with an acronym that will guide everything we’ll do during the 5-week course. In each zone that we cover, I will encourage you to “Create S-P-A-C-E”. Each and every week, we will Sort, Purge, Assess, Contain, and Evaluate every last item in your kitchen to ultimately purge out what doesn’t belong and re-organize what remains in order to truly maximum function! This FREE course is delivered via 7 emails across 5 weeks. Here is what is included in each email! TIPS & TRICKS. 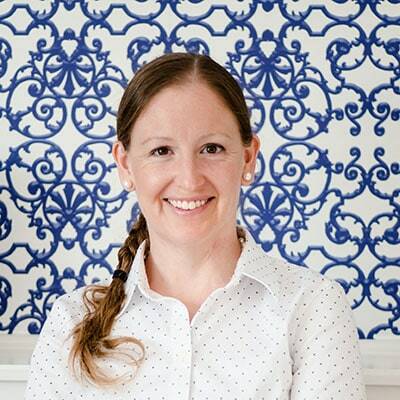 Each email will be jam-packed with my BEST kitchen tips, tricks, and ideas for that particular kitchen zone. These are easy solutions for common problems that you can try right away. 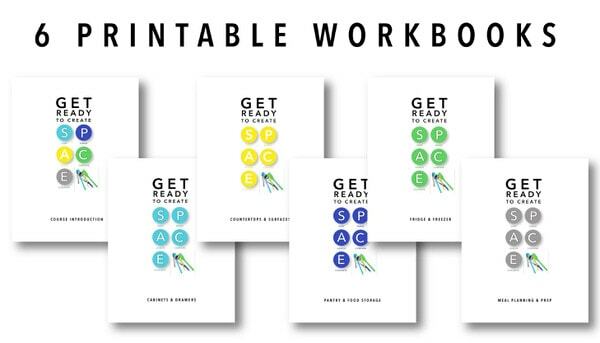 PRINTABLE WORKBOOK. 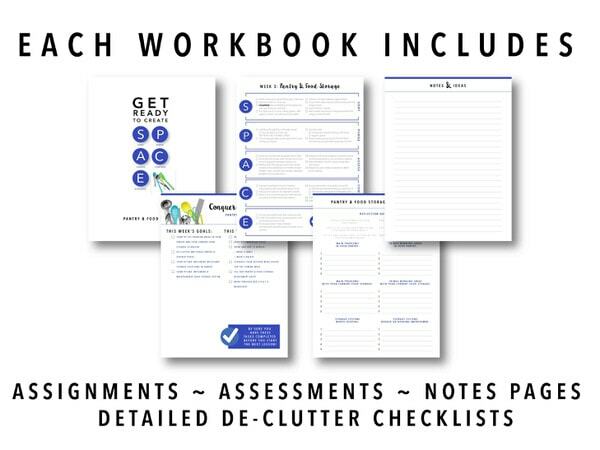 Each email will include a printable workbook full of assignments, checklists, sorting signs, assessments and more! I am practically giddy about this new printable set and will explain more about them below! BEST OF THIHM! Many of you long-time readers know I’ve written A LOT of kitchen-related posts over the years. From meal planning to spice storage, freezer organization to food labels, I’ve covered a lot! Each email will include links to my best posts (written for THIHM and other sites) related to that week’s kitchen zone. BEST OF THE WEB! There are a lot of great ideas on Pinterest, but there are also a lot of really bad ideas and dead ends out there too. It can be exhausting to wade through everything on the web to find the right and best solutions for your home. So…I’ve done it for you! I’ve spent hours combing through Pinterest to find THE BEST kitchen tours, DIY projects, and solutions for the most common kitchen problems by some of the best bloggers. Each week, you’ll be delivered a whole slew of hand-picked links to check out and be inspired by! MY FAVORITE PRODUCTS! I love a DIY solution any day, but there are also a lot of great products out there that can really help you make the most of your kitchen. Each week, I’ll be sharing some of my favorite products to help you conquer the zone we’re working on! The weekly emails are full of great information, but the real work of this course is delivered in a series of printable workbooks. 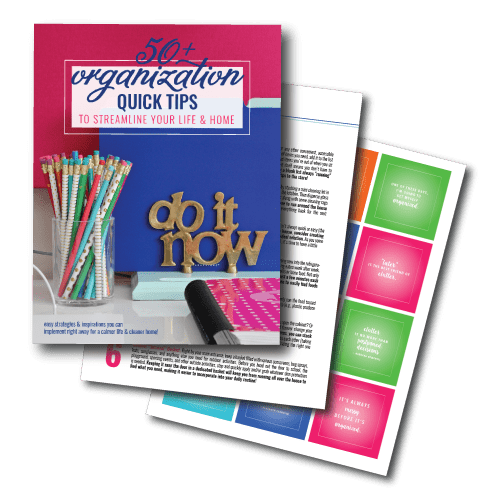 Over 25+ pages of brand-new printables (across 6 workbooks) have been designed for course participants. 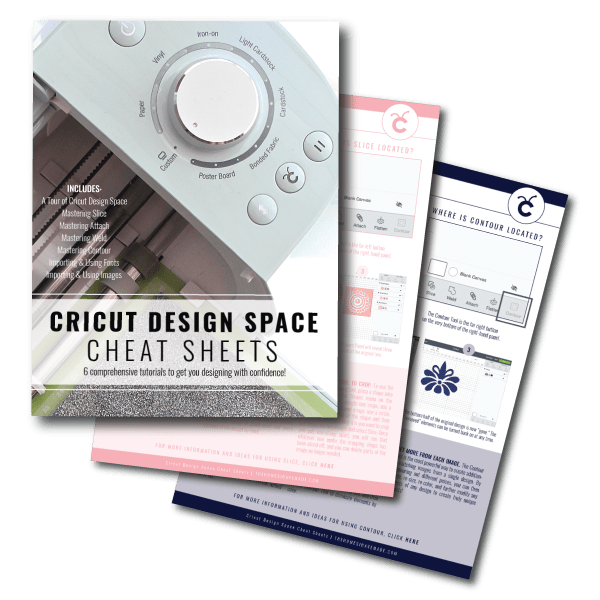 There is a Course Introduction Workbook, and then workbooks for each of the 5 kitchen zones (all color-coded, of course!) Inside each workbook is a weekly assignments list (for keeping track of everything to read and do! ), a zone assessment form, notes pages, and the S-P-A-C-E worksheet to check off de-cluttering tasks as you finish them! Each workbook is uploaded directly to the email (no password-protected page this time!) in PDF format. 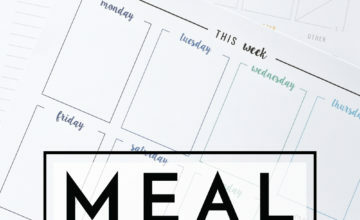 I have had so much fun designing this new series of printables…and they may or may not be the foundation of a new kitchen-inspired kit (#comingsoon!!!). If I could come to your kitchen and help you, I would! But I can’t (unless you’re buying me a plane ticket!). The next best thing is to make myself available to you by giving you access to an exclusive Facebook community where you can interact with me as well as other people going through the course! 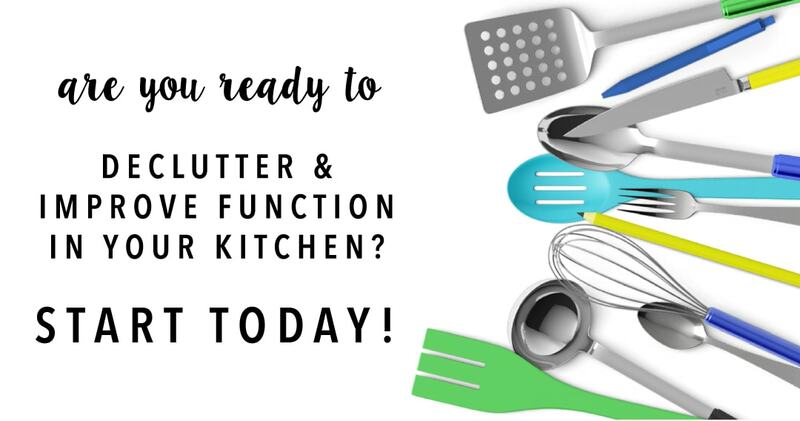 This Facebook group is a place to ask questions, troubleshoot problems, get input, interact with me, and receive lots of good ol’ motivation to conquer your kitchen! If you’ve ever wondered “What would Megan do here?” now you can find out! I know, and I hear you. Email courses and marketing are HOT right now, and our inboxes can’t seem to catch a break. However, here’s the thing. I just spent 3 months doing a printable series. While many of you loved it; if you didn’t, then you were most likely bored/uninterested for 3 months! In addition to providing you all with the ultimate resources and motivation to conquer your kitchen, I also want to provide ultimate specificity and flexibility as well. For those of you who want and need the information, I have it ready for you! For those of you that don’t, no worries! We’ll be getting back to the DIY stuff here on Thursday! As such, this email course is NOT a one-time deal! It will be here whenever you are ready for it. Maybe you are ready for it right now! If so, awesome…let’s get to work! But maybe you’re moving soon (like we are), and could really use the plan when you’re moving in. Maybe you want to do this when kids are back in school. Or maybe you need to take charge of your kitchen, but you’re just not up for it right now. That’s okay too. This course will be right here, waiting for when you are ready! One more note on flexibility. The course is designed to be done over 5 weeks because I don’t want it to feel too overwhelming. If you don’t want to stretch it out that long, I recommend you sign up now, let all the emails come in over the next 5 weeks and then work from one lesson to the next at your own pace! See, options for everyone! So!!!!! 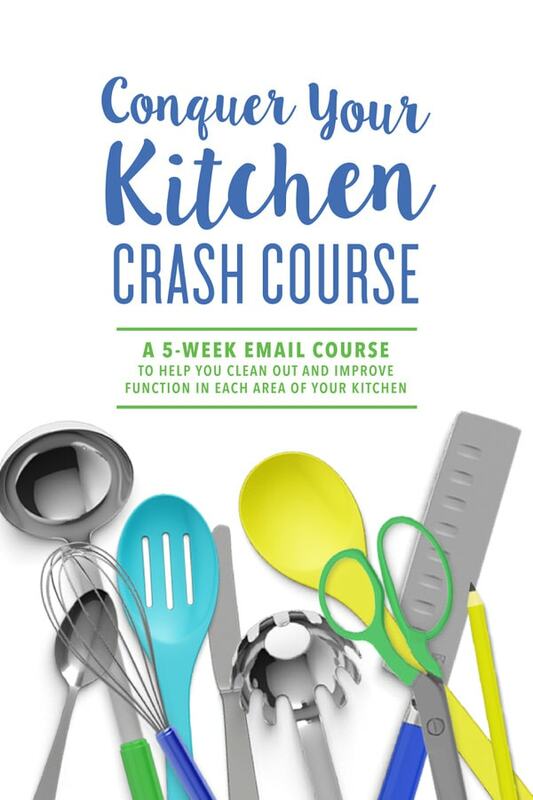 If you are ready to Conquer Your Kitchen, I invite you to sign up for the Crash Course below. Your very first email will be delivered straight away. (Please note: if you already subscribe to my Newsletter, you will NOT be automatically enrolled, so please sign up below!). If you’re not ready just yet, I’d love it if you Pinned or bookmarked this post for later. And I don’t ask very often, but I’d love it if you shared this post on your own social media accounts or with anyone who might benefit from it! It’s been a really, really long time since I’ve been SO excited about something. 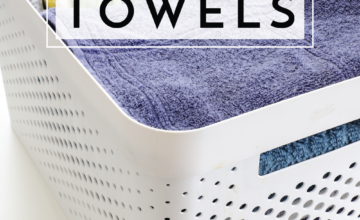 I think you guys will really love this e-course, and I can’t wait to expand upon what I have here to make a whole host of usable resources to help you de-clutter and improve function in your home! See you back here Thursday with a fun Spring Cleaning project! 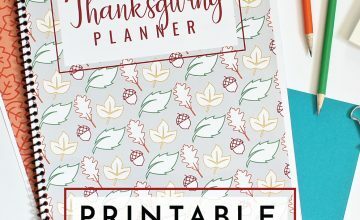 Looking for even more PRETTY PRINTABLES to get your recipes, meal planning, coupons (and more!) organized? 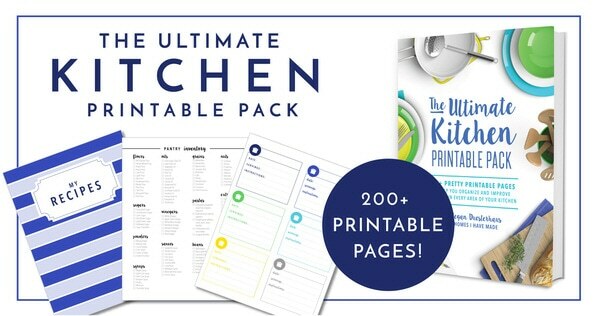 Check out The Ultimate Kitchen Printable Pack HERE!! !